SUPERBOOM Projects Sdn Bhd, a property developer, expects its latest project in Ipoh, Perak, to generate a gross development value of about RM250 million. The Haven, expected to be Perak's most luxurious condominium project, will comprise three residential blocks. So far, 80 per cent of the units at the first block and 20 per cent of the units at the second block have been booked. According to chief executive officer Peter Chan, buyers can expect prices to rise by about 30 per cent. "Currently, we are selling at RM338psf. But, we have been told that the property can fetch as much as RM450psf if the market knows what The Haven is all about," said Chan in a media briefing in Kuala Lumpur yesterday. He was speaking to the media after the signing ceremony with Bina Puri Holdings Bhd and Beijing Construction Engineering Malaysia. Superboom hired both companies as joint main contractors. Chan expects the property market in Perak to grow with the new Ipoh-KL electric train service and as more planes fly to Ipoh. "Perak has not seen major development in the last 20 years. But, with so much development recently, it certainly makes the timing of our project spectacular," said Chan. The Haven will come in various types, from the entry level units of under 1,000 sq ft to penthouses of 5,000 sq ft. As the condominium is located near the hillside and forest, and has a lake view, Chan believes it can attract foreign buyers as well as those from Kuala Lumpur. "Although these natural resources are a common sight to those living in Ipoh, it is something unusual for many of us. I think this makes The Haven an ideal place for vacation and an ideal place for a home," said Chan. So far, piling work for the first block has been completed, and both Bina Puri and Beijing Construction Engineering are due to complete the project in 2013. It also expects to open its third block for sale in about six months and prices of these units are expected to be higher than the current RM338psf it is offering for the first two blocks. The Matrade Centre and Warisan Merdeka, two large property projects worth a combined RM20 billion, will include offices that will be marketed to multinational companies (MNCs). "The two projects will have office towers with full-fledged upmarket facilities, even better than the Petronas Twin Towers," Federal Territories and Urban Wellbeing Minister Datuk Raja Nong Chik Raja Zainal Abidin said. The RM15 billion Matrade Centre will be built by the Naza group. It will include an exhibition centre, residences, offices, a mall and a hotel, spanning 26ha, under a privatisation deal with the government. The 10-year project will be launched next month. Warisan Merdeka, located within the enclave of Merdeka Stadium and Stadium Negara, will have a 100-storey tower. The project, which will start next year and be completed in 2015, is an initiative by Permodalan Nasional Bhd (PNB). Raja Nong Chik said PNB has done its homework to ensure the project will be viable. However, PNB will have to address the issue of limited road access as the project is located in a densely occupied area. "The project is a good move by PNB, which is looking at various avenues to invest. But they must ensure that the tower is taken up as the money is coming from them. They are answerable to their shareholders. "PNB also has to ensure that the building is attractive so that investors don't go to Singapore, Vietnam and India. We will lose then," he said. Raja Nong Chik was speaking to reporters in Kuala Lumpur yesterday after opening the 2nd International Conference on World Class Sustainable Cities 2010. He also said that the ministry aims to launch Invest KL by early next year. It will work with the Malaysian Investment Development Authority (Mida) to encourage MNCs to set up shop here. The minister expressed confidence that the government would achieve its target of having 200 new MNCs by 2020. Currently, there are 1,800 MNCs in the country. "While the number is small as compared with Shanghai, which has 16,000 MNCs, and (against the) 4,000 in Singapore, we hope to surpass 2,000 in 10 years." Invest KL will target MNCs worldwide, especially from the Middle East, China and India. The aim to make Greater Kuala Lumpur a sustainable and livable city can easily be achieved with high-quality infrastructure, green spaces and developing inner city residential areas. Minister of Federal Territories and Urban Wellbeing Datuk Raja Nong Chik Datuk Raja Zainal Abidin said a flexible strategic vision was necessary to foster competitiveness and build a comprehensive transportation linkage and network in the area. He said projects like the RM40 billion mass rapid transit system (MRT), increasing pedestrian walkways and the Klang River beautification project to promote recreation, urban revitalisation and real- estate development will contribute in making Kuala Lumpur one of the most livable cities in the world by 2020. "The Tenth Malaysia Plan has dedicated a whole chapter on the building of an environment that enhances the quality of life. 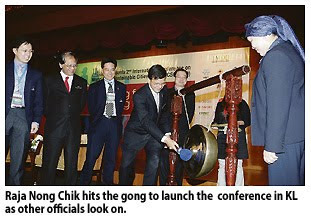 We are encouraging better city designs and innovations," Raja Nong Chik said in his speech at the opening of the 2nd International Conference on World Class Sustainable Cities 2010 in Kuala Lumpur yesterday. A sustainable city is a city designed with consideration of environmental impact to improve the quality of life. This includes ecological, cultural, political, institutional, social and economic components, without leaving a burden on the future generations. "A thriving city will continue to grow. It is therefore vital to properly plan a city to meet future needs and challenges," he said. The Greater KL is one of the National Key Economic Areas. It is expected to increase gross national income contribution from RM258 billion to RM650 billion per year. The government wants to achieve top-20 ranking in the EIU Liveability Index Survey and grow the population from six million to 10 million, with a focus on growing the foreign talent base from 9 per cent to 20 per cent of the population. KUALA LUMPUR: The joint venture (JV) between Bina Puri Holdings Bhd and Beijing Construction Engineering (M) Sdn Bhd (BCEG) has won a RM109mil contract to build The Haven, dubbed to be the most luxurious condominium in Ipoh. The contract, awarded by Superboom Projects Sdn Bhd – a privately held property developer, is for the construction of the high-end residential project slated for completion in 2013 with gross development value of RM250mil. The Bina Puri led-JV was chosen over seven bidders. 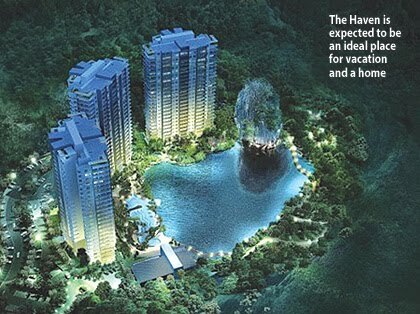 The leasehold Haven, Lakeside Residences is a 26-storey building with 489 units located in Tambun, Ipoh. Superboom chief executive officer Peter Chan (pic) said The Haven, with its special features and quality, would be the best value luxury condominium in the world. “Selling at RM338 per sq ft, the price range will be between RM300,000 and RM1.7mil for various units of between 968 sq ft and more than 5,000 sq ft (penthouses). “The price is definitely lower than the price (of similar residential) in the Klang Valley but it cannot be a lot lesser as the building cost is the same although the price of land per sq ft in Ipoh is about one-eighth of that in Kuala Lumpur,” he said after the signing ceremony for the appointment of the JV as the main contractor for the project. In terms of price appreciation, Chan said they expected a high increase. “According to the experts, intrinsically it is worth RM450 per sq ft by the time the market realises its potential. “The take-up rate has also been encouraging so far prior to the launching scheduled by year-end or early next year. Currently 80% of block A and 20% of block C have been sold. “Construction works of the two blocks (A and C) have already started but development of block B is expected to begin in the next four to six months,” he said. Chan said the strength of this development lay in its location besides its facilities and conveniences. There are features such as the attractive limestone and green environment and it is 12 minutes drive to the city centre. Meanwhile, Bina Puri chairman Datuk Wong Foon Meng said both parties in the JV had equal roles and responsibility. Each company would bring its own niche strength to the project, he added. “With our vast experience in the construction and property sector, we are confident of delivering the project within the stipulated time-frame,” he said. To date, Bina Puri had delivered projects exceeding RM7.8bil. So far this year it managed to clinched new projects up to RM1.64bil. BCEG, on the other hand, has completed several projects worth RM265mil in the Klang Valley. It is part of BCEG Group from China which is on the top-225 international contractors list. Meanwhile, Superboom’s porfolio included the 576-unit Permai Lakeview Apartments in Ipoh and Subang Galaxy in Shah Alam. It has incorporated The Haven Sdn Bhd primarily to undertake The Haven development. TA Global Bhd has signed a 50:50 development sponsorship agreement with Sydney-based property funds management and development company Charter Hall Group to develop the A$600 million (RM1.84 billion) Little Bay residential project in Sydney, Australia. The project, on 13.6-ha of Sydney’s prime coastal area, was acquired by Charter Hall’s Opportunity Fund No 5 in early 2008. It is expected to include over 500 dwellings, comprising houses, townhouses and apartments. In a statement, TA Global executive chairman Datuk Tony Tiah said the development was a highly attractive opportunity for the group to expand in Australia. NUSAJAYA: Besides targeting foreign investors, UEM Land Holdings Bhd wants to attract more local investors to participate in the development of Nusajaya. Its Nusajaya project director Zulkifli Tahmali said investors could buy land in Nusajaya and develop it themselves or team up with the company in joint-venture projects. However, UEM Land would not embark on a project if the potential partner was also involved in property development, he said. “The best example is our collaboration with Malaysian Biotechnology Corp Bhd (BiotechCorp) in developing BioXCell, a biotech park project,” Zulkifli told StarBiz at the launch of the company’s newest housing project Nusa Bayu here recently. Occupying a 32.37ha site in the 526.10ha Southern Industrial and Logistics Clusters (SiLC), BioXCell is being developed by Malaysian BioXCell Sdn Bhd. UEM Land holds 40% equity in Malaysian BioXCell and BiotechCorp the balance. Zulkifli said UEM Land’s role was to provide land and infrastructure, and manage facilities at the park while BiotechCorp would regulate, market and offer incentives to local and foreign biotech companies to set up operations at the park. UEM Land is the master developer of the 9,308ha Nusajaya, the key driver of Iskandar Malaysia, the country’s first economic growth corridor. Nusajaya is one of the five flagship development zones in Iskandar. The other four are the Johor Baru City Centre, Eastern Gate Development, Western Gate Development and Senai-Kulai. Zulkifli said UEM Land owned 3,885ha in Nusajaya, of which 2,023ha was vacant land. Of the 1,862ha set aside for development, 40% was being developed and 60% demarcated for future development. The projects currently underway are Puteri Harbour Waterfront Development, Nusa Idaman, Ledang Heights, East Ledang, Horizon Hills, Nusa Bayu and SiLC. “Land prices in Nusajaya have increased since the launch of Iskandar and with several major projects slated for completion within the next one to two years, the trend is likely to continue,” said Zulkifli. The projects include the RM1.4bil New Coastal Highway linking Johor Baru city centre to Nusajaya, RM715mil Legoland Theme Park, RM300mil Newcastle University Medical Campus and RM400mil Pinewood Iskandar Malaysia Studio. Zulkifli said the company would only sell its value-added land with infrastructure facilities and utilities to command better selling prices like what it did for 60.7ha Puteri Harbour Waterfront Development. He said UEM Land had pumped in about RM200mil for infrastructure and utility facilities at Puteri Harbour and the selling price had rocketed to RM250 per sq ft now from RM12 per sq ft five years ago. “We also want to attract more Singapore investors to Nusajaya and with the improved bilateral ties between Malaysia and Singapore, Johor is going to benefit the most,’’ said Zulkifli. MIDF Research believes Mah Sing Bhd's landbanking activities will gather momentum despite the company's recent RM1.1 billion acquisition of Kinrara, Subang-Damansara and Bukit Jelutong land parcels. Mah Sing's combined gross development value balance and unbilled sales presently stood at RM6.27 billion and RM1.17 billion respectively, the research house in its equity note today. It also expected Mah Sing's year-on-year earnings growth for the second half of this year to be in the region of 25 per cent. Mah Sing has revised its sales target for this year to RM1.5 billion after exceeding its earlier target of RM1 billion in July with aggressive new launches. MIDF Research said Mah Sing would be able to replenish its unbilled sales with the planned new launches in the fourth quarter of this year, thus translating into higher revenue and therefore earnings going forward. Projects that are scheduled to be launched include Garden Plaza in Cyberjaya, Star Avenue (Damansara), Southbay Plaza (Penang), Icon City (Petaling Jaya) and Kinrara Residence. MIDF Research said the proposed issuance of RM325 million seven-year redeemable convertible secured bonds (RCSB) was part of Mah Sing's medium-term strategy to focus on acquiring sizeable land bank for potential mass housing development. "The RCSB proceeds would be sufficient to acquire sizeable piece of circa 190-200 acres of development land in Cyberjaya," it added. Mah Sing's current projects in Cyberjaya are Garden Residence and Garden Plaza. In the horror film Drag Me To Hell, an old gypsy woman was so angered by a loans officer’s refusal to extend her mortgage payment that she attacked her in the bank parking lot and later placed a curse on her. The young officer, Christine Brown, could have chosen to help Sylvia Ganush but she wanted to impress her boss and get a promotion over her co-worker. Ganush had knelt before her, begging her not to take away her home. But Brown decided to call security, which was when Ganush lost her head. Such incidents may only appear in films and one’s imagination but it dramatises the point that foreclosure is a cruel and extreme measure. In the United States, reports of foreclosures and lately, mistakes, speak of untold suffering and confusion among homeowners. According to Bloomberg, attorneys general in 50 states last week announced an investigation into whether employees of lenders such as Ally Financial Inc, JPMorgan Chase & Co and Bank of America Corp falsified documents used in foreclosure proceedings. Lenders were also said to have suspended foreclosures in many states after court documents revealed that people working for some large mortgage firms signed papers without checking their accuracy. Although the problem is serious in the United States, which is at the heart of the action following the burst of the huge subprime housing bubble, it cannot be assumed that problems of a smaller scale will not appear elsewhere. In Malaysia, the fact that property loan curbs and taxes did not surface in Budget 2011 should not be taken to mean we should let our guard down on any potential property bubble. Although talk has subsided on discussions between the authorities and industry, it is believed that the intention to impose some kind of curbs is still very much on the cards. It was earlier reported that a loan-to-value ratio of 70% to 75% for the purchase of third and fourth homes was being considered as a major step to deal with any potential speculative activities. We should not wait until the authorities clamp down on the market. Instead, proactive monitoring and self-restraint play an important role in the collective consciousness to stem any occurrence of runaway prices. Bidding up the prices is another practice that should be looked into against fundamental reasons and proper data collection. In the current build-up of funds into emerging markets, care has to be taken to avoid excessive speculation in the property market as we do not want our people to lose out in any way should the bubble burst. Senior business editor Yap Leng Kuen believes that prices for a sound investment should not crash overnight. PETALING JAYA: Sabah-based Karambunai Corp seems to have received more than its fair share of attention in the past month. More recently, it hit the limelight when recently-revealed Budget 2011 stated that Nexus Karambunai – a renowned resort in Sabah – had committed to develop an integrated RM3bil eco-nature resort. Under the Karambunai integrated resort plan, there are plans to develop a 150ha eco-nature resort at Karambunai alongside a mangrove centre, water theme park and waterfront properties to push for higher return on investments. It is understood that the RM3bil investment will be privately funded, although there are yet to be any concrete details on how this funding will be raised and by whom. The budget stated that the project would commence next year. In the same paragraph on the Karambunai initiative, the budget proposed that “to support the tourism industry, the Government will allocate RM100mil.” However, it is not clear if this means that the Government will actually invest that money directly into the Karambunai project. The major shareholder of Karambunai is its president, Tan Sri Chen Lip Keong, who owns 43.9% stake in the company. The 62-year old also owns gaming company NagaCorp, which is listed in Hong Kong and operates a casino in Cambodia. Having long languished as a penny stock, Karambunai Corp’s shares have been on an uptrend in recent weeks, recording its 52-week high yesterday at 26.5 sen. This stands in stark contrast to four months ago, when the stock price was hovering at a meagre 5 sen. Still, scepticism abounds on Karambunai’s ability to execute this grand plan, not least because of its weak financial status. The company has been in the red for the past three financial years. For the quarter ended June 2010, the company continued to remain in poor financial health, suffering losses of RM14.39mil from a previous loss of RM14.62mil. Revenue was up 7.78% to RM24.03mil. As of the period, the company had cash amounting to RM7.29mil. In addition, it has piled on huge debts with short-term borrowings of RM192.07mil and long-term borrowings of RM283.77mil. This is not the first time the counter has witnessed such exuberance in the absence of any fundamental development. A month ago, the company made headlines when it was speculated that it would start a casino operation in Sabah. The speculation came about from a proposal of the 500-acre “eco-nature” resort in Sabah by the Performance Management and Delivery Unit (Pemandu) at the Economic Transformation Plan (ETP) open day a month ago. This piece of speculation drove the share price from 5.5 sen on Sept 21 to 18 sen in a matter of three days. On Sept 24, Karambunai informed the stock exchange that it has not submitted any official proposal to the Government, nor had it penned any written documents with any other third parties in respect of any plan to build a casino in Karambunai. So for now, the company has yet to come up with any concrete plans for the eco-nature resort. Again this week, on Monday, the company had to clarify to Bursa that it had not signed any understating or agreement with any parties and does not have any corporate developments which merit public disclosure. The company said its controlling shareholder, in his private capacity, had acted as a promoter to invite interested parties to invest in Karambunai. Karambunai said its property was included in the Budget 2011 speech after its Nexus Karambunai Hotel general manager attended the Performance Management and Delivery Unit-driven national key economic areas tourism lab together with other members of the private and public sectors. In 1984, the company announced that it would go into the leisure and tourism market as well as property and construction, manufacturing, trading, infrastructure development, and even aerospace and information technology. On Sept 13, 1993, the company changed its name to FACB Bhd and later to FACB Resorts Bhd on Sept 30, 1999. Currently, Karambunai owns about 1,500 acres in Karambunai, a peninsula which lies some 27km north of Kota Kinabalu airport. Its flagship asset is the Nexus Resort & Spa Karambunai, a luxury 5-star 485 room international-class resort hotel with a world-class 18-hole golf course, combining elements of modern architecture with Borneo design and style. Its latest development in the area are the beachfront Nexus Residences Karambunai (NRK), which features upmarket beachfront resort villas and will comprise about 2,000 units when completed.